The San Francisco Health Network’s low-income patients bear a disproportionately high burden of food insecurity and health consequences such as hypertension and diabetes. Improving the availability and consumption of healthy and nutritious foods, including produce and whole grains, would have significant impacts on this public health challenge. According to a recent study led by researchers at UC San Francisco, HIV positive people who received healthy food and snacks for six months were more likely to follow their medication regimens. The study also found that people with type 2 diabetes were less depressed and less likely to make trade-offs between food and healthcare. Food pharmacies represent an opportunity for healthcare providers to engage and inspire patients around healthy eating to promote good health. Food pharmacies “fill prescriptions” written by doctors and prescribed to give patients access to healthy food. Providing food in a medical setting reduces the stigma associated with receiving food aid. These pharmacies also support sustained nutritional behavior change by providing cooking instruction, recipe sharing, and nutritional counseling in addition to free, nutritious foods. 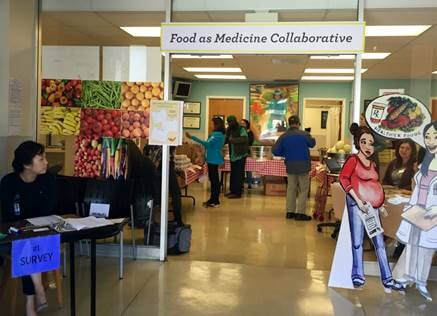 The Hellman Collaborative Change Initiative GROWTH grant enables the collaboration to scale their food pharmacy program across 18 community clinics in San Francisco reaching about 13,000 low-income patients.